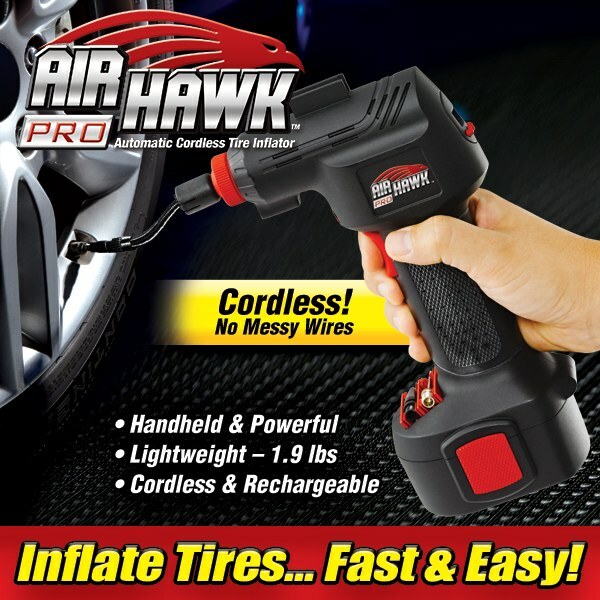 Air Hawk is the new way to inflate tires, sporting equipment, and more! Air Hawk is a cordless, handheld air compressor that pulls in outside air and compresses it into the tire. It&apos;s fast, easy to use, and extremely convenient. No more driving to the gas station or pulling out a large air compressor just to fill your tires. Air Hawk features a built-in digital pressure gauge, and you can set it to automatically turn off once the desired pressure is reached. Set includes 3 nozzles; one for car and bike tires, one for sports equipment and inflatable balls, and one for everything else such as pool floats, air mattresses, and more. Works as advertised and filled a low tire on my lawn tractor in about 10-12 seconds. Great for blowing dust off of computer keyboards and other household uses. 37 people found this helpful. Was this review helpful? 30 people found this helpful. Was this review helpful? I am disappointed because I thought this product was advertised as being cordless, and it is, except they don&apos;t tell you that the battery don&apos;t last very long (20 minutes) until it needs recharged again. However, it does come with a cord that you can plug into your car as long as your car battery isn&apos;t low when you have to pump up your tire. DOES NOT WORK AFTER CHARGING BATTERY. Great, but gets hot when using for a long time. More than 20 minutes. Airhawk is fantastic. Works as it is advertised. Use it all the time now, instead of lugging around the portable air tank. I recommend this to everyone. Love it! Compressor works well as advertised. Portability is excellent. Easy to keep in vehicle. VERY POWERFUL. TAKES MUSCLE TO FIRST LOAD BUT THEN EASY! I keep one in wife&apos;s car, for my own peace of mind. Great, very useful product. Only thing was, I thought it came in s hard case rather than in a bag. This is a great Scrubber, I no longer have to stress my back to clean the tub&apos;s and tiles. My wife bought me a airhawk for Christmas. I took it on vacation with us and I actually had to use it it&apos;s a wonderful tool. So I purchased two more Air Hawks for two of my relatives for Christmas presents. I would recommend buy one of these and put it in your car. Or taking it on a trip with you just in case of an emergency. Workes very well. My Husband loves it. More than anticipated. Light, digital meter, home and away charging systems.